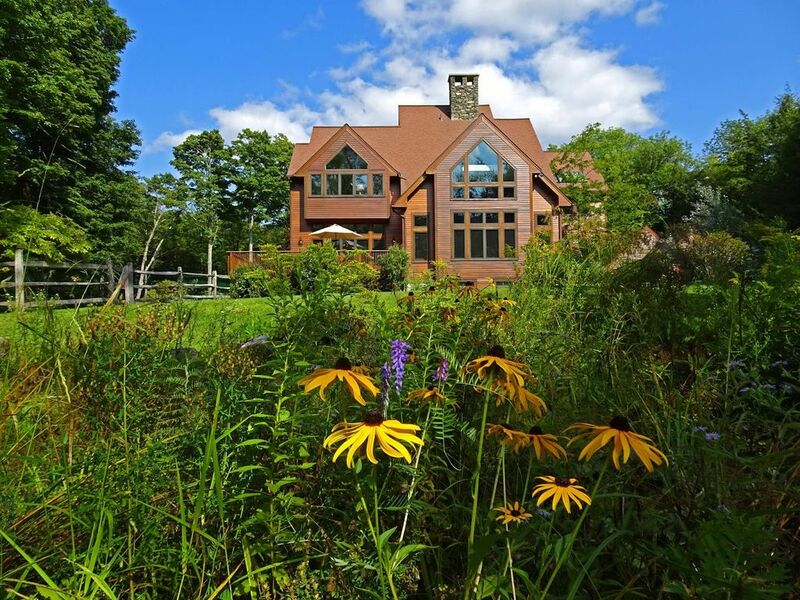 This elegant four bedroom, five bathroom, custom built residence is surrounded by nature and majestic mountain views, and less than 1 mile from the great skiing at Sugarbush mountain yet in a quiet exclusive neighborhood. The property also backs up to Sugarbush’s Robert Trent Jones Sr design 18 hole golf course. Designed for entertaining friends and family, this welcoming, private home radiates mountain beauty with windows everywhere allowing natural light throughout. The spacious kitchen, great room with one of a kind fireplace, and open dining area is well equipped for entertaining family and friends. There are 4 private bedrooms and a great basement for the kids with 4 bunks and a pull out sofa. In all the house can sleep 14. The private outdoor living area features a beautiful deck with grill and stunning views. There is a fire pit built in a zen garden in the backyard that is perfect for roasting marshmallows and a shared swimming hole just off property that will delight the whole family! This home is great in all seasons! This property has a 60 Day cancellation period for a full refund. All week-long winter rentals are from Friday- Friday unless exception made by owner. Summer check-in/out days are flexible. This is our first and most popular property. Not available? Check out our other properties in Warren on HomeAway; the property names are Riversong (in Warren Village), Scenic Solitude (our newest property, near Ole's X-Country Ski Center)Happy Trails (also recently renovated). Happy Trails is close to this property, at the end of a private road just above the Sugarbush base area and parking lots. Scenic Solitude is our favorite and most beautiful property and is currently our home base at Sugarbush. We started to visit Sugarbush regularly in 2006 after a single weekend visit early in the ski season when we made the impulsive decision to find a last-minute seasonal rental. We were hoping to find a property as modern and luxurious as some of the properties we had stayed at in Nantucket and at Western skiing resorts but realized quickly that luxury rental properties are a rarity in the Mad River Valley. After multiple mediocre seasonal rentals in the area, we decided to invest in our own property in 2013. Two years ago we began renting our property and had immediate success. This reinforced our belief that there were other families like ours wanting a more luxurious experience when they visited the Mad River Valley. Bringing together our love of investing, real estate, and interior design, last year we formally started a business and purchased 3 more properties in the area and over 100 acres of land that we intend to develop in the future. We have been busy renovating and decorating these properties and are excited to share them with you for the Winter 2018 ski season and beyond. table extends to 122 in. and can accomodate large groups although there are 8 seats there regularly. There are 4 spots to sit on the island as well. Rumble Road exceeded my expectations in all areas... spacious, comfortable, yet luxurious. Proximity to the mountain made our trip so smooth and convenient. The house was clean and welcoming, kitchen was fully stocked, and the basement a huge plus for the kids to hang out. The owners were genuinely invested in our experience and were very easy to communicate with, I can only hope I am lucky enough to spend more time on Rumble Road!! This is our second year in a row staying at this property. The location access to Sugarbush cannot be beat. The house is very spacious, very clean and had everything we needed for our stay. The large kitchen opens up to the living area with a great wood fireplace, comfortable furniture and a large TV - great for prepping meals and unwinding after a long day on the mountain. We will definitely look to stay here again! We had a wonderful time. The house is spacious and well-maintained. It's very comfortable and very near Sugarbush. Would certainly stay there again. We stayed in the house over Thanksgiving. The house is beautiful, well equipped and there is plenty of space to spread out. The owners are really helpful and very responsive. Overall, we had a great time and would highly recommend this house. This was our best rental by far! From the very beginning trying to get my family members to commit to the trip and to dates wasn’t easy. The home owners were a wealth of information, very accommodating and patient! We had family coming from 4 different states and our 84 year old parents were coming for their dream trip. There were conversations on bed configuration, bathroom accommodations and so much more. We arrived and the home was perfect, no steps for our elderly parents, gourmet kitchen for our family meals, a huge table...we ate all our meals together, beautiful fireplace that we used everyday. The views were breathtaking every day. Most important... the house was very clean and the beds were so comfortable. We can’t say enough. We thank you for a perfect week! Wonderful house, great location, well equipped, very comfortable beds!